As I was cleaning through my office drawers today for the requisite spring cleaning, I realized I had a problem. I’m an addict. What am I addicted to? Photobooths. Sad but true, I can’t walk past one without jumping in. 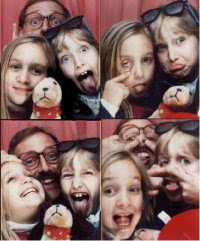 The problem started young- check out the 1st photo below of me with my dad and sister. But who are my current enablers? The team at Say Cheese Photobooth. 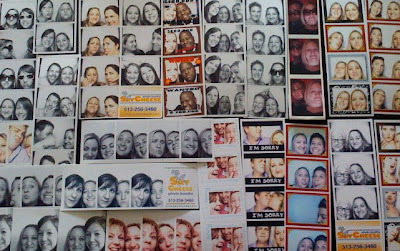 At Say Cheese, they print duplicate copies of every photo strip, so your guests get a strip, and so do you! 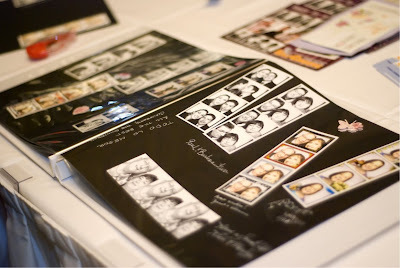 For a small extra fee, they’ll create a guestbook on-site, filled with your guests photos and well-wishes. The other reason I love Say Cheese: Frank and Pat – the father/son owners – are just simply great guys. Check out their website and let them know I sent you! Say Cheese is currently running a contest to win $500 off your photobooth rental – check out their blog for details! My friends at the Bridal Studio are hosting three “Sunday Wedding Cafés”: March 29th, June 28th and September 27th from 11:00 a.m. to 1:00 pm. Hosted by the Bridal Studio and featuring a panel of local, recently married brides who are willing to share their experiences, tips and best practices, the Wedding Cafés are an opportunity to enjoy a cup of coffee, ask questions and engage in a relaxed and informative environment with your peers. 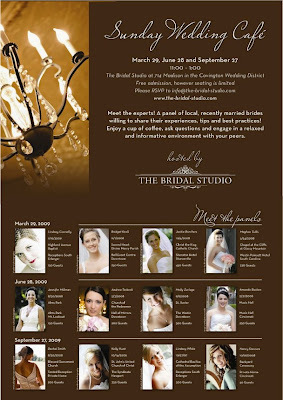 Admission is free, but seating is limited so please RSVP to info@the-bridal-studio.com.